Phoebe Day 3: No new egg? 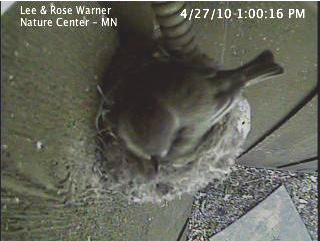 I was teaching all morning so I didn't have time to check out our Phoebe Webcam before heading off to a local school. When I returned, I checked the image expecting to see a third egg. Songbirds typically lay one egg per day and do so in the morning. When I checked the camera all I saw was a bird. The phoebe was on the nest. Or so it seemed. The time stamp on the image seemed to be about 15 minutes off. I waited twenty seconds and refreshed the image but sure enough, it was frozen. I went down to nudge the computer that uploads the images and when I did I could see the live image below. 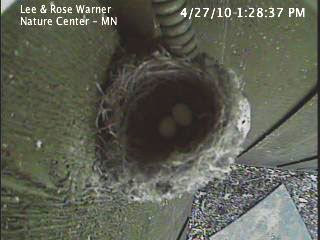 There are still only two eggs in the nest. Why didn't the phoebe lay a third egg this morning? When I spoke with staff who were on-site all day they indicated that the phoebe had spend much of the day sitting on the eggs and moving them around. It would seem incubation may have begun. Usually birds do not sit on the eggs until all of them have been laid. This way, incubation starts at the same time and they all hatch at the same time. Why start incubation with only two eggs? A usual clutch size is four or even five eggs. Because the old nest in this location fell down, the phoebes had to build a new one. Building a new nest is energy intensive and in some cases can mean a reduced clutch size. Two eggs may be all we get in this nest. I did notice two male and two female Brown-headed Cowbirds hanging out in a tree very close to this nest. Cowbirds lay their eggs in other bird's nests. There's a good chance that if another egg does appear it will be from a cowbird and not from the phoebe. Check back to find out. Tomorrow morning should be interesting. Interesting footage and predictions for this nest. Look forward to future posts.